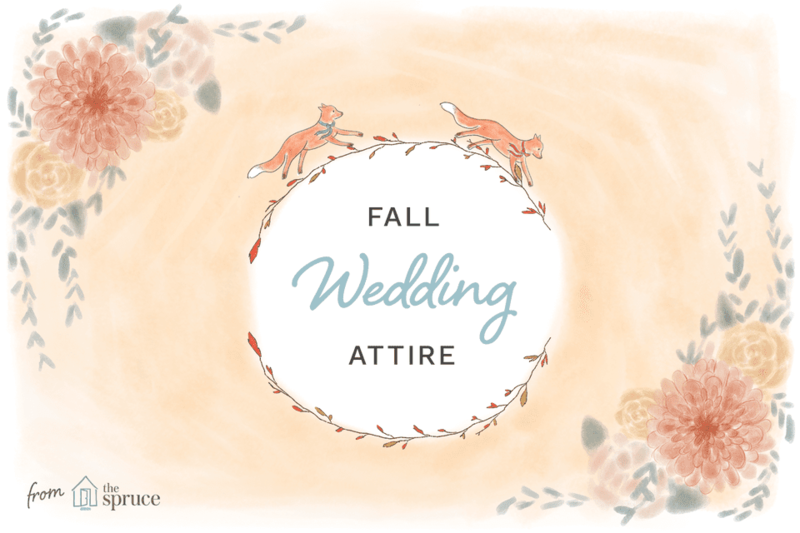 If you're headed to a fall wedding soon, you're probably wondering what to wear! Here are our suggestions for every type of fall wedding. A casual daytime wedding needn't mean wearing something old from your closet. Take the excuse of a wedding to update your wardrobe and buy something you can wear again and again. Choose a dress that is comfortable, chic and versatile! Dress it up with a great pair of heels, or pair it with some great boots and a thin leather jacket. People who are invited to a late afternoon wedding ceremony and an evening wedding reception are often unsure if they should wear a daytime or evening look. After all, wearing a sparkly dress in a church feels awkward and uncomfortable, but it's no fun to be in a day dress when everyone else is wearing party clothes. The trick is to look appropriate at both without having to change clothes. Look for a dress with simple lines that can be dressed up or down. Add a little jacket and simple earrings for the daytime ceremony but tuck a pair of dangle sparkly earrings and some great bracelets in your bag for the evening reception. It's the same day-to-night trick women have been pulling off for years at the office—there's no reason it can't work for the wedding guest as well. A casual evening wedding doesn't mean that wedding guests should be wearing jeans and t-shirts. Men should wear a dark button down shirt and a nice pair of pants, and women should wear a chic but simple dress. Be comfortable, but still look pulled together and stylish. Our rule of thumb is to look for a dress you could wear to a workplace function—in other words, no heavy beading or luxe fabrics. Add some metallic accessories and you're set! If you're going to a formal daytime wedding, you should wear a smart, short dress or a sharp suit. The dress should be formal, but not beaded or black. Stick to bright colors and lighter fabrics to look appropriate for daytime. The trick is to find a dress that looks sophisticated rather than stuffy. Save the plain black for the office, and look for rich colors and fabrics that will help make a dress appropriate for a fall wedding. Although many people are confused by "festive attire" weddings, it's pretty straight forward. You should wear a party dress or a cocktail dress that makes you feel festive and fun. (Save the floor-length evening gown for a different occasion.) Think: bold colors and and eye-catching details. Men should wear a suit, perhaps with a fashionable accessory like suspenders or a designer tie. All that "Black Tie Optional" means is that you have the option of wearing anything from a cocktail dress to a formal gown. If you are still uncertain, try to fall somewhere in the middle so that you feel comfortable with whichever direction the crowd has tended to go. (Nothing like showing up in a ball gown, when everyone else is in comfortable wrap dresses!) Take a cue from the reception venue: a historic home or ballroom in a high-end hotel call for a more sophisticated look, whereas a cocktail length gown feels more appropriate at a restaurant. At a black tie fall wedding, men should wear tuxedos and women should wear formal gowns. While you can get away with wearing a dressy cocktail dress, it's better to wear a floor length gown or an evening suit. Black is acceptable, but a jewel tone will feel more festive. Consider gowns with beading, sequins and other embellishments. Fall can be a tricky season to dress for in general, and attending a wedding makes it all the more tricky. Outdoor ceremonies and cocktail hours are popular options for fall weddings, but you don't want to spoil your great dress by wearing a too-casual sweater or outdoor coat. Here are there are three ways that you can stay warm without ruining your outfit. A cute cropped jacket A cropped jacket in faux fur or leather will definitely keep you warm, and the length will still allow you to show off your dress. A modern shrug Situations like this are practically what the shrug was made for. The arms will keep you warm while the open front won't hide your dress. A chic wrap True, pashminas were way overdone in the mid-90s, but there is a way to wear a stylish wrap. Consider a blanket wrap which will keep you warm and keep your arms covered in a fashionable way.